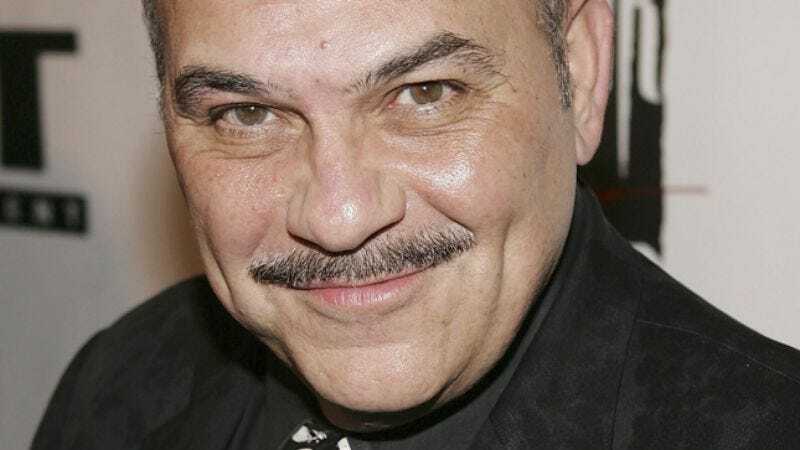 The Actor: Jon Polito specializes in playing cops and mobsters, most famously in Homicide: Life On The Street and Miller’s Crossing, respectively. The gravel-voiced, mustache-sporting character actor’s professional association with the Coen brothers has reaped rich rewards: After Miller’s Crossing he went on to appear in Barton Fink, The Hudsucker Proxy, and The Big Lebowski. In the ’80s, Polito’s distinctive look and voice helped win him roles in iconic films like Highlander before he scored a role in Michael Mann’s cult show Crime Story. Polito can currently be seen in The Last Godfather, a mob comedy co-starring Harvey Keitel which is now available on DVD via Lionsgate. Jon Polito: Crime Story was where I learned that I needed to get to know every crew member: what they did and what their names were and who their families were and whatever things they would give me. The prop man or the lighting man. I would talk to everybody on that set. By asking them what they did and taking an interest in them, they took an interest in me. You get to know the focus-puller. You look to the camera operator, to the DP. And basically, when the scene is shooting, you then know that, for the most part, those guys are watching you act. And therefore you’ve got an audience. And that’s when my acting began to be much more, to me, natural. I was able to watch my acting and see a performance instead of being self-conscious. So that was the gift of Crime Story. The A.V Club: You were in Death Of A Salesman on Broadway and in the television adaption. JP: Well, the stage performance was an amazing thing. I was nearly fired from the production when we opened in Chicago. When I was supposed to read for the play, they wanted me to read for the character of Biff because they couldn’t get a commitment for one year from John Malkovich. And I had done a play rather similar to something that Malkovich had done in New York. He did True West and I did a play that was very well-received critically. So they asked me to read for Biff. Well, I never wanted to play a Biff a day in my life. I never liked the character. I just couldn’t do it. So in my audition, I actually went on the stage in front of [Dustin] Hoffman and said, “I don’t want to play Biff, I don’t want to read for Biff. I’m only interested in the role of Howard,” which they had already committed to someone else. But I always wanted to play that role, Howard, because from the first time I saw the play and the movie, the early version with Fredric March and the television version with Lee J. Cobb, when it got to the scene where Willy Loman goes to the young boss, I always felt that the other actors who had been playing the part—all good actors, indeed—but I always felt that they played it a little twirly-moustached, “Ya ha ha.” A little too much like the bad guy. But the lines, to me, as I listened to them, even as a kid, made me think, “Well, wait a minute, this guy’s going crazy in the boss’ office. So really, the boss is not that off in his telling Willy that he’s fired because he’s crazy.” We already know that the guy’s going crazy. So basically, that was the performance I wanted to give. So I was cast doing that kind of performance, but when we opened the play in Chicago, Hoffman did not get good reviews. So basically what we did was, I suddenly turned around and rehearsed that day. I remember we rehearsed for about four hours, and then the performance I began to give out of town was this kind of wicked, mean guy. And then, slowly, when we got to Washington, to the Kennedy Center, I remember him coming up before we started those performances and he said, “You can lighten up more.” And then when we got to New York, that man said, “You can go back to your performance.” Hoffman was incredibly generous and he is an incredibly generous and interesting performer who was really tackling a tough role. So I was more than glad to do that. The great part about Hoffman on the stage was he really began to thrive on every accident that happened on the stage. At first, he was thrown out of town if the wire recorder wasn’t working or if any little thing wasn’t working, he’d be thrown. And then, eventually, he began to thrive on those mistakes and bringing the performance to life. One of the important things about Willy Loman is, he says to his son Biff, “If anything falls off the desk, don’t pick it up. That shows a sign of weakness.” And yet, one night, I went to grab a cigarette in the scene and the cigarette flew across the stage and he groveled on the floor to pick it up. It was an amazingly pathetic moment. It was brilliant! Hoffman was brilliant on the stage. When we got to the film, Volker Schlöndorff was directing, and I really felt that his mounting of it was a little too precious with Hoffman. There were a lot less accidents, let’s say. And, in particular, here was one thing that I think was a great loss: On the stage, Steve Lang, who is now very famous from Avatar and is going to be in the new Spielberg series [Terra Nova], Lang’s performance as Happy on the stage was just brilliant and spontaneous every night. Just a wonderful piece of art. And I’d known Steve Lang’s work for years and was always a fan of his and we worked together in Crime Story. Oh, after that. Later, actually. But we knew each other from the stage from different things. And I really felt that in some ways, that spontaneity was cut out of the film version, as well as my spontaneity, because Volker Schlöndorff sort of cut favoring more the—I don’t know, it just didn’t seem that spontaneous. So I was less fond of the film, although it’s the film that’s used by students to learn about the play now. Because of Malkovich and, you know, the cast was quite incredible. JP: Well, it was shot in London, so all I remember is very funky, ’80s London, which Christopher Lambert was the king of at the time because of his position from the Tarzan movie [Greystoke: The Legend Of Tarzan, Lord Of The Apes]. And it was really a terrific shoot time. The director was also a lot of fun to work with. I did not get to work with Sean Connery, which is still a great regret in my life. Although we’re in the same movie, I’m one degree from him. Because I was in the same film, but I didn’t get to work with him because he was in the flashback sequences. I just remember it being a lot of fun to shoot both in London and in New York. We came to New York for locations as well. I didn’t quite figure out what the hell was going on. It’s a tough movie to figure out. And, of course, Christopher Lambert is a very interesting actor, but him playing the Scotsman is just hysterical, I think. I think the film is really a lot of fun to watch as a camp classic. I love the idea of you got so many accents. There couldn’t be more accents. But one of the great gifts of that movie was getting to meet Clancy Brown, who played the bad guy. And Clancy was just a real force to be reckoned with. I remember loving Clancy as a person and loving his performance. AVC: Why do you think the film has become such a cult phenomenon? JP: Well, you know, it’s one of those things that started. One of these waves of things. I guess, because, unbelievable to me, people still like swords and men in skirts. I just think they love the power to live forever. It’s kind of one of those boy elements. It’s a boy movie. You know, there are boy movies. It’s very funny because I just finished work on It’s Always Sunny In Philadelphia. And I’m a big fan of that show. But when you watch that show, that show is a boy’s show. It’s for boys. It’s a dirty, poopy, farty, fun show for boys. And I think that’s what Highlander became, a boy movie that was followed because of them. I don’t really know the other films as well. The follow-up films. It’s the same thing with The Crow. I was in the original Crow, and, of course, don’t know those follow-up films. JP: Oh my goodness! You are really picking the obsolete! Now there was a movie we all thought was going to go into a new series of films. You know? Now, Remo Williams, I had nothing, really, to do on. And the funny thing about Remo was, we were doing Salesman at the time, and Dustin decided to take time off in the summer, which is really unheard of. They kept the theater dark for him to take a month off and come back in the fall. And I believe my day shoot was like, the week after. I had one day. But I was doing the one day on the Statue Of Liberty, which was in the process of being refurbished, so the island was closed to people, for the most part. I mean, there was nobody there. We only used the actors that were given permission to shoot. All I really did was chase the lead guy [Fred Ward] all over the Statue Of Liberty. So I had nothing really to do. The funny part about that movie is, I’m kind of known at this point for my voice, my gravelly voice. But in fact, they dubbed in my first line with some actor from England. It’s like when you watch the old—what’s Mel Gibson’s first film? JP: Mad Max. We watched Mad Max with his dubbed-in voice or when you watch Schwarzenegger in Hercules In New York, it’s really great, the other voice. But it was a great experience, also, for me, because as much as I didn’t really have much to do, Joel Grey was in it. And I was a big fan of Joel Grey, who ends up killing me. That was a great experience to work with Joel Grey. AVC: You got to be killed by one of your heroes. JP: Yes! It’s happened to me many times in my career! AVC: Kind of lucky in that respect. JP: Yeah… Lucky or unlucky. It’s an iffy question. JP: Yes. That was very interesting. There was a director that I had loved. Michael Apted, who’d done a great series of documentaries on these young kids growing up [the Up series]. I was a fan of his and I got to work with someone I totally loved, which was Richard Pryor. The amazing thing about that movie to me was that the two scenes where I meet him in prison and then there’s a trial scene, the trial scene was one of the funniest scenes I’ve ever read. I thought it was gonna play like blockbusters. But when we got on the set, it was the first time I realized—because this is pre-my really good film work and I hadn’t done that much film—when I got on the set, Richard Pryor mostly improvised the scene. So it threw me. It didn’t throw me off acting-wise. I remember him turning to me and saying to me, “I’m gonna just run with this.” In fact, he didn’t run with it. He didn’t say one line from the script. So that was a little disorienting, but the scene plays pretty well and it’s kinda funny. A wonderful actor played the judge, as well, in that scene. So that was an interesting experience, getting to work with Pryor. AVC: You didn’t have much experience with that kind of improvisation? JP: Well, you know what it is? I was a theater actor. So when I had the other scripts and films and series—I did a series earlier on called The Gangster Chronicles when I first came out here—but those things, you stick to the script. I wasn’t used to working with somebody who threw the script out before the scene started. That was a very different way of working for me. JP: Oh my God, I love Mickey Rourke. I. Loved. Mickey Rourke. He was a bad boy. First of all, I’m working with Chris Walken. I had done Measure For Measure with Chris Walken at Yale years before, and I think he’s brilliant. And it was such a joy to be working with him again. He’s playing my flunkie in this movie called Homeboy. But it’s also Mickey Rourke, who wrote the script, although he uses a different name for the writer on the script. But it’s really his script. It was not very well directed, I thought. Because there was an awful lot of listening to everything that Mickey Rourke was saying. I thought he was much better when he was challenged by people. But the great part for me was, I had to go up to the boxing ring and he was gonna try an improv and I could see him preparing for something and he asked for a piece of chocolate. But he didn’t know I was watching him and he was going to spit this chocolate on me as I was trying to yell at him in the ring. So I remember just as we were getting to filming that part and he shoved this chocolate up his mouth and I’m watching him, just as we’re about to rehearse, I said, “You’re not gonna spit at me are ya?” [Laughs.] And he was furious! And he spit right next to me. But he was very angry that I ruined his improv. I thought it was a great moment. And he was tolerant of me. For God’s sake, anybody who’s worked with me has been extremely tolerant of me. So I love Mickey Rourke. JP: Mmm. What were the years you said? JP: I remember everything about El Gato. El Gato was brilliant. That was an insane role. Basically, the word I got was an offer, there was no audition. They said, “We’ve got a gay Hispanic drug-dealing, drug-taking lunatic, and we thought of you.” I thought, “Hey! That’s perfect.” The best part for me was when I walked on the set and I walked to wardrobe and talked to the wardrobe girl, who said, “I see this guy trying to be in and wearing padded shoulders.” And I saw it and said, “I love this idea.” Sequins, I have a neon pin I wore in the first scene. It was the most tasteless thing. And then I said, “Well, what about if we never show his hands?” Because I always loved the idea of him wearing gloves. I thought, “When am I gonna get the chance to play a queen who wears gloves?” So I asked for gloves. So I would never show my hands. And I asked for padded shoulders and everything. One of the best scenes, I think, is the scene where I’m actually outside wearing black shorts and I have on a polyester shirt, in which I have inserted padded shoulders. [Laughs.] I think that shows just about how tasteless this guy was. Also, there was a great moment there. I remembered there were some beautiful boys that were these extras. And there was one boy in particular that had this long, beautiful hair. And since I was bald, I said to the casting people, “Keep that boy in my scenes. Always in my scenes. So every time you see me looking sweaty and bald that there’s this beautiful boy in the back. Keep him as contrast.” You know what I mean? I always loved the idea of surrounding yourself with different colors and palettes. JP: Oh, The Freshman was amazing. I, of course, loved Matthew Broderick. And the Brando situation was, I remember I was in the hotel and we hadn’t worked yet. I hadn’t worked with Brando. And I was staying at the famous hotel in Toronto that everybody stays in. I can’t remember the name right now. And I got into the elevator. There was somebody with a hat on in the corner and I got in and faced front as one does. And I could feel this incredible energy. Really just energy, behind me. And I turned around and it was Brando with this big, wide-brim hat on. And, of course, I was all perky. “Oh, I’m gonna work with you.” And you’re scaring the hell out of him because he’s very short. He’s about 5-foot-6, I believe. Or 5-foot-7. He was incredibly heavy and looked like an older man. He was 65 at the time. But I had thought to myself, “That man truly has a palpable aura about him.” It was quite an amazing presence that he was. And then, of course, I watched what he did with his makeup. First of all, he does his own makeup. He’s not in the makeup room. He does it in his trailer with his makeup man. But he does it in the old theater way of looking in the mirror and doing your own makeup. That, he put together, along with the fact that the design of his character had Frankenstein shoes on that actually added, I think, 6 inches to his feet. So he was walking on these massive Frankenstein-type shoes, you know? So he made himself into this massive powerhouse. It was a beautiful transition to watch this simple man being such a genteel gentleman and then turning into this massive iconic figure of a Don Corleone sort of character. That was a great experience. AVC: Brando famously turned on the film. JP: Oh, that was amazing! Well, that was really because Brando was having problems at the time with his family in Tahiti. So he had to leave for one week. For the most part, I gotta say this, Brando was on that set for that whole shoot. I’d never seen anything like it. People used to say he would fly in for a week, fly out for other movies. That movie, he was there. He stayed. He was there and he was working a lot and he was having a really great time. He and Matthew had such great scenes together, blah blah blah. And then we shot in New York. He was terrific then. But we were back in Toronto, doing the end of the film, and they waited until the very end to do the ice-skating scene. Now, this is a 65-year-old man ice-skating. That man fell so many times during that shoot. It was unbelievable. He was falling on the ice. It was a very, very rough shoot. Now, the producer… I think his name was Mike Lobell. I don’t think Brando was terribly fond of Mike Lobell. And Mike Lobell was gonna throw a party at one point and Brando threw it himself. That kind of stuff. But anyway, I believe the scuttlebutt was, Brando was to stay an extra week. And he had been there for the full six-to-eight-week shoot. And he asked for another million dollars and he was told no. He said, “If you don’t pay me this extra million dollars, then I will bad-mouth this film.” And they still said no. The next day he came out and all the papers are saying it’s the worst film he’d ever been involved with. They paid him the million dollars the following day and the day after that, he came out and said he loved doing the film! He was ready to do the sequel. That’s Brando. That was Brando in a nutshell. Really very funny. Very powerful. Don’t mess with that man. AVC: That was probably the last time anybody played hardball with Marlon Brando. JP: Exactly. I think the word got around you don’t do it. I was very obnoxious. But anyway, the word came down that they weren’t gonna read me. So I went off and I went to Miami. I did Miami Vice. We were just talking about it. El Gato. And then I was cast in the play Other People’s Money, the original production of that at the Hartford Stage, which became a movie with Danny DeVito, which is another story. But anyway, I was up in Hartford when I got the word that the Coens were on the last legs of casting and they were finally going to see me for Johnny Caspar. And so I went down from Hartford, Connecticut, went to New York, and I read the opening speech. And I remember I was rather annoyed because the casting woman, whom I love, Donna Isaacson, but she has one of those little lapdog things and she kept it in the room. And I’m doing that opening speech and I start it and then the lapdog’s barkin’ and stuff and I finally went out and I was furious and she said, “Don’t leave, don’t leave.” And I said, “I’ll go back in if you get rid of the damn dog!” So she kept the dogs outside and the Coens called and asked me to go back in the room. And they had me read cold the entire role. Scene-by-scene. I read every scene in that movie. Because I think they didn’t really know me well and they certainly wanted to see if I could deliver it. And whatever I did in the room meant I got cast. Even though I know there was another actor that was actually in the negotiations to get that part. So I was really very, very lucky—and the Coens, I’ve spoken to them recently, I’ve talked to them about how important they’ve been in my life—that that accident happened. That I didn’t read for the other role, which is actually quite like how I got Death Of A Salesman. Sometimes you just gotta stand up for what you want to read for. And in that case, I was able to get Johnny Caspar. And really, I believe that one six-month period shooting in New Orleans, that one role, has led to my workload ever since. AVC: That’s the fountainhead where everything started? JP: That started the second part of my career. Because you have to understand, my first part, I was very different-looking. I was very slender. I played leading men. I did lots of things. You know, in an actor’s career, if you’re a character guy, you have to reinvent myself at every stage and every weight. I have been many different weights. I’m not somebody who looks the same as I did when I was 20. AVC: But it seems like the Miller’s Crossing look is what resonated. JP: Well, that did take. But Barton Fink, I don’t look anything like the same character. JP: Yeah, come on, look at that. That character’s nothing like the Miller’s Crossing character. The story about Barton Fink, which is really lovely, is that I wasn’t interested in playing that part even though they supposedly wrote it for me. I wanted them to cast me in the Michael Lerner part of Lipnick. But they wouldn’t see me. They would say, “We’re not gonna use you. We’re all free with Lou Breeze.” So I asked them to see me in Other People’s Money. I was now in New York doing it. And said to them afterwards, I was buying them dinner and drinks—Frances McDormand was there and Joel and Ethan and Ethan’s wife—I said, “Well? Well!? Aren’t you gonna cast me as Mr. Lipnick?” And they said, “Oh, no no no. We’re casting you as Lou Breeze.” And I said, “Well, I don’t wanna do Lou Breeze.” And they said, “Well, that’s up to you, but that’s what we’re offering you.” And I basically said I wasn’t interested. And I walked out. It was so wonderful that she did that. And it was a wonderful choice because it showed immediately that there was so much variation. It was great and helpful. I enjoyed very much doing that part and I remembered the creation of the part when Ethan had the hairpiece made with the comb-over, which was used in several performances. That same hairpiece I used in the Seinfeld “Landlord” role. So the hairpiece thing and then the glasses. And when I looked in the mirror, I made my voice [Nasally.] much more up here and nasal. And immediately, when they heard that, they said, “That’s the character.” So it was complete variation for me. And the wonderful gift, once again, from Joel and Ethan. JP: Ohh! The Rocketeer! I loved that movie. That was a lot of fun. That was a good experience because I loved those kinds of characters. That’s the kind of stuff from the old Warners films or an old C.B. DeMille circus film. That was a big, bombastic guy. Plus, it was directed by Joe Johnston, who I was a fan of. I was a fan of his special-effects work. And I knew the leading man because he was on Crime Story. Billy Campbell. Billy Campbell had been on Crime Story, not really doing much, but he had been lovely to look at and lovely in his performance, so I knew him and now he was a leading man playing this part. That was all a wonderful experience. And we shot it in Santa Maria, California at an airport and those planes were really shooting over us. The special-effects stuff was a variation between the special effects and the real planes and stuff. Like, today, everything would be done digitally. But then, they were using real planes and real stunt people. It was beautiful stuff. AVC: I think that was part of the appeal of The Rocketeer. That it was kind of old-fashioned. JP: Yeah! It was wonderful. I particularly loved the makeup guys and the special-effect guys. ’Cause I think I get bent in half in the middle of that thing. And I’m the guy who names him The Rocketeer, for God’s sake. They were named different names at the time. So I waited for about a month before I got word that Levinson and Tom Fontana would see me for the other part. So when I went in and had a reading, I was able to get the other part and they renamed it Crosetti. So that was how that worked. And, of course, the part I read for they gave to Clark Johnson. He was not black in the original script, so what was lovely about those gentleman was that they cast the best actors that they felt brought the most music to each part. Not really based on the real characters at all or the real nationalities of the characters. JP: Well, that wasn’t a big year. That was a big year because of The Crow. But the funny part with that was that character was just a one-scene screaming part that the Coens wanted to shove me in, sort of like a talisman for their film, because I had been in the other two. And the way it worked out was, I was going to be in North Carolina doing The Crow at the very same studio. So that’s how we were able to work out me doing the cameo. They were going to work around my Crow schedule to put me in. So there was nothing really to say about that part, just to say it was a screaming part on that crazy gorgeous set that they built for Hudsucker. The set was amazing and, of course, the set was produced amazingly. The important part about that shoot was that we were on that same lot doing The Crow and in The Crow we were doing all street scenes and shooting at night, and The Crow was a very bad-luck film from the very first moment. JP: Yeah, well, let’s put it this way: We were shooting at night and the very first day they were setting up the lights, there was a guy who was driving a cherry-picker onto the lot. A cherry-picker that you put lights on. And the cherry-picker fell into a gully, and we lifted the back of the cherry-picker where the guy was lifted up, and went right into an electrical pole and he was electrocuted. And he was near death. All of his organs were burned. He was about 26. His wife was pregnant. It was a bad luck opening to a film. And then the third night when we were shooting, I remember the prop truck caught on fire and nobody knew what that was about. And then we had a hurricane that destroyed parts of the street sets. The hurricane was so bad. Of course, we were staying at the hotel Holiday Inn Cape Fear, so that should give you some sense of what the film was gonna be like. And I loved Brandon Lee. He was a beautiful, sweet man. And I remember my first scene with him was his breaking through the glass to come into my shop at the end of the fight. And I remember him breaking through the sugar glass and his body got cut. I remember one of the first things I said to that man was, “Don’t pull a Vic Morrow on this film. Don’t endanger yourself in any way.” Vic Morrow was still fresh on our minds at that time. JP: Ohh, Da Fino Big Lebowski! It’s the 15th anniversary of Big Lebowski coming up. Well, that was a one-night shoot, so my experience really had to do with Jeff Bridges. And I couldn’t really make heads or tails of the script except that I remember it being very funny. And then walking on there, I’d never seen anybody look as dirty or as disgusting as Jeff Bridges. He looked like he smelled. That guy and his performance with that beautiful phrasing is so brilliant in that movie. So let’s say that the evening was a magical one. Jeff Bridges was magical to work with, of course. It turned out to be something that, once again, was not very popular when it opened up, [but] turned out to be a rather iconic film. So that alone has put me into the realm of the iconic, I guess, just because I’ve touched these Coen brothers. That I’ve really been able to have a career based on the fact that what they touch is gold and I just keep holding onto them and touching them.